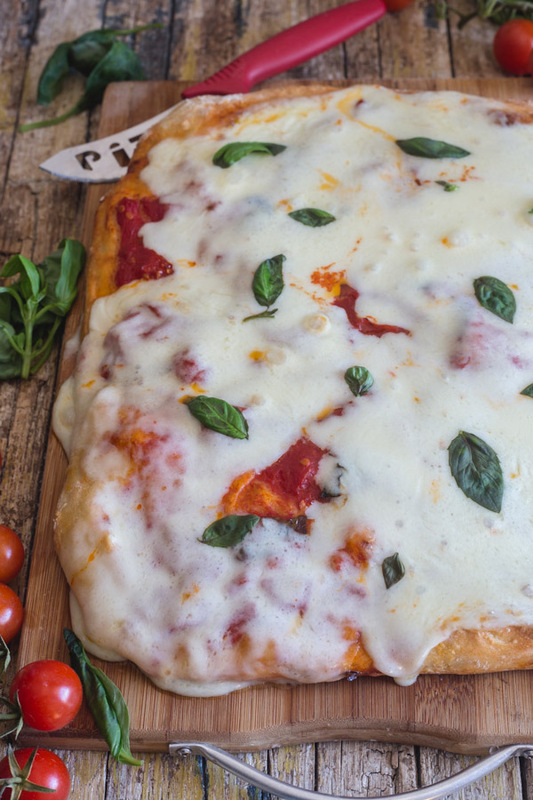 This Homemade Traditional Italian Pizza Dough Recipe, is the only Pizza Recipe you will ever need. Make it by hand or in your stand up mixer. Authentic Italian Pizza never tasted so good. 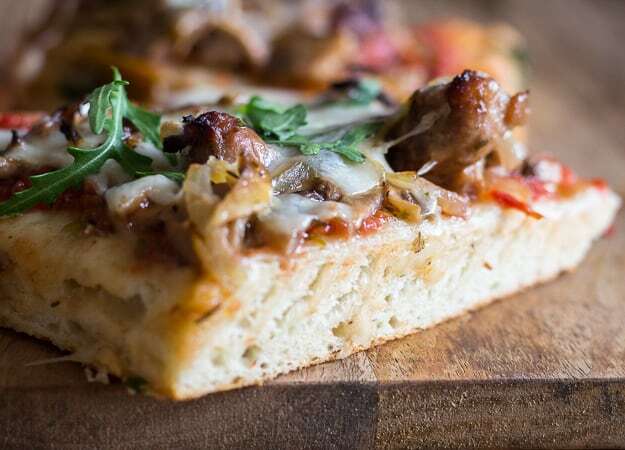 Everything you need to know to make this your family’s new favourite Pizza Recipe. In your house what day is pizza day? If you are like us it could mean any day. Sometimes Friday or maybe even Saturday but last week it was Sunday! Pizza Margherita to my favourite Italian Sausage and Artichoke Cheese Pizza to one of the Italian’s Grilled Zucchini Pizza. In Italy it is so easy to get a good pizza dough. Sometimes I would stop at my local bakery (forno) and pick up a pound or two of dough. But when I tasted a pizza made with this dough, I thought no matter how good the bakery dough was, it was now a thing of the past for me. That pizza made me determined to make my own pizza dough from then on. Needless to say this pizza dough was one of those recipes that was passed down for I can’t tell you how many years. And trust me it is the best Pizza Dough. You can make it thin crust or thick crust whatever suits you, then you can top it with whatever fresh ingredients you want. What is the best flour for making Pizza Dough? To tell the truth some people will swear by bread flour, but I always use all purpose (11% protein or higher). It’s not necessarily the flour but how you go about making the pizza that counts! In a small bowl add the water, make sure it is lukewarm (if it is too warm it will kill the yeast), then add a pinch of sugar to the water. Sprinkle the yeast over the top, stir to combine, then let it rest for about 5 minutes. If the yeast is active it will dissolve in the water and the mixture will bubble. With this Pizza Dough Recipe I made two large and one small pizza. 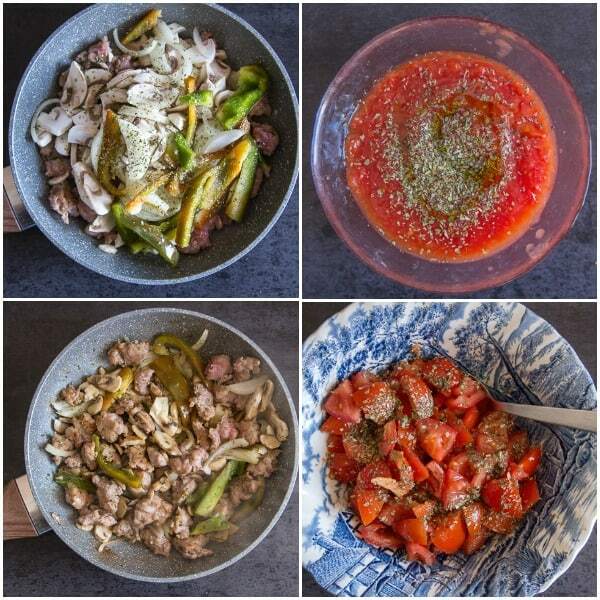 Sometimes I will make an all veggie one, with fresh, halved, cherry tomatoes, peppers, mushrooms and onions. Or I will sauté a couple of Italian sausage (casing removed) with sliced mushrooms, peppers and a small onion and place the mixture on a pureed tomato sauce (with just a few spices and a little olive oil). For the third pizza I top with chopped fresh tomatoes and sliced black olives and of course all the pizzas are topped with shredded firm mozzarella after they were baked. 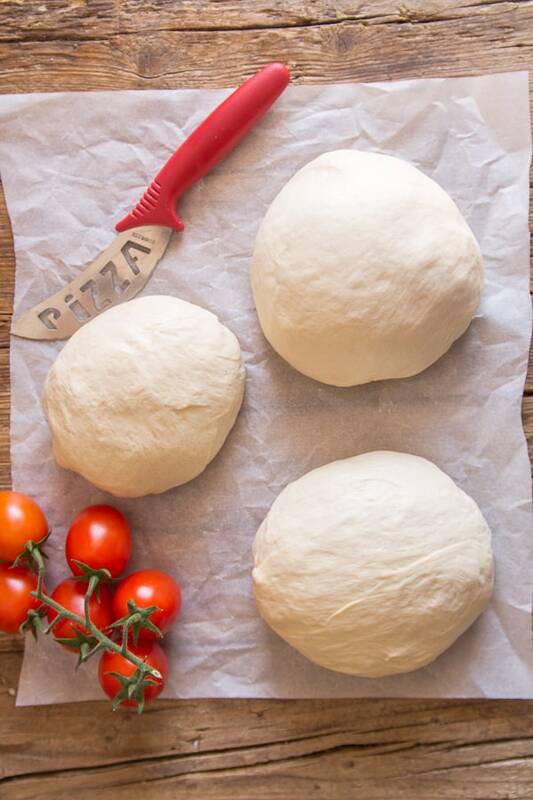 -When making Homemade Pizza Dough be sure to knead the dough until it is smooth and elastic. -Let it rise in a lightly oiled bowl (make sure to turn the dough in the bowl so it gets covered lightly in oil), cover the bowl with plastic wrap and a clean large kitchen cloth. -Place the bowl in a warm draft free area and let it rise for about two hours. 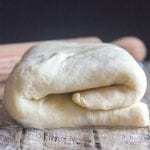 -Once the dough has risen, divide it into 2-3 rounds, make sure to cover the rounds with the kitchen cloth and let it rest for about 30 minutes. This way your dough will spread and not spring back when you try to fit it into the pan. No knead to roll the dough with a rolling pin, clean hands work best. Let the dough rise before freezing, then divide the dough into your desired pizza portions, place in airtight freezer bags and freeze. Dough will last up to 3 months in the freezer. Let dough thaw overnight in the fridge before using. Pizza should always be baked in a very hot oven 450F (250C). It’s best to top your pizza let it cook then add the shredded mozzarella cheese and bake until melted. So however you like your pizza, thick crust, thin crust, double cheese, veggie or pepperoni I hope you try it with this pizza dough. Buon Appetito! 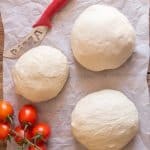 Best Pizza Dough, an easy, homemade pizza dough recipe that will become your favorite go to for pizza night. Thick or thin crust you decide. In the bowl of your stand up mixer (or a large bowl if you knead by hand) add warm water then add yeast and sugar, let sit for 5 minutes, then stir to combine. Add the olive oil, flour and salt,with the hook attachment start to combine on low speed, scrape the hook and then raise to medium speed and knead for approximately 5-7 minutes or until you have a smooth elastic dough (scrape the hook halfway through kneading). If you are mixing by hand then with a fork mix until the dough starts to come together. On a lightly floured surface remove dough from the bowl and knead until dough is smooth and elastic approximately 10 minutes (if dough is really sticky add a little extra flour). Pre heat oven to 450° (250° celsius). Punch dough down a few times and divide into 3 balls, let dough rest for 20 minutes. Place dough in desired pizza or cookie sheets (lightly oiled) and fit dough into desired shapes (using your clean hands). 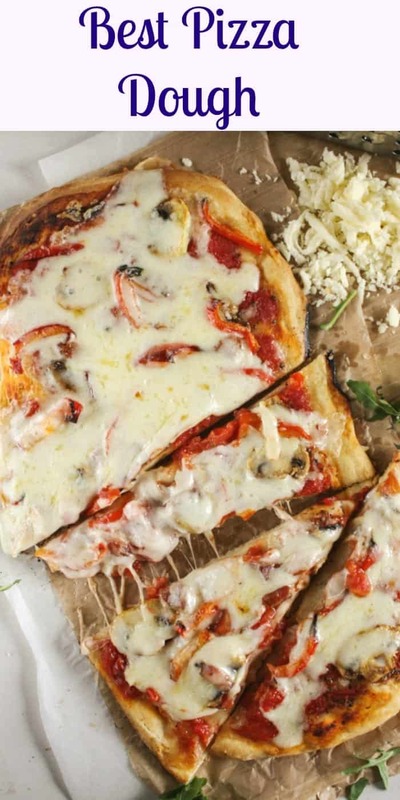 Top with your favourite toppings (without the cheese), bake for approximately 15-20 minutes (until crust is golden) and then top with grated mozzarella cheese and bake for three more minutes or until cheese is melted. Enjoy! **At this point, dough can also be refrigerated, place in plastic bag, remove air and tie securely up to 24 hours. In a medium bowl add a can of diced or pureed tomatoes, add 1 teaspoon oregano, 1 teaspoon basil, a sprinkle of salt, tablespoon of olive oil and stir to combine. Top pizza dough. Chop fresh tomatoes (grape, roma or cherry tomatoes) remove seeds, toss with 1 teaspoon oregano, 1 teaspoon basil (or even fresh) salt and a tablespoon or 2 or olive oil. In a medium frying pan add Italian sausage (casing removed and chopped) and fry until starting to brown, add thinly sliced, onion, pepper and mushrooms and a drizzle of olive oil, 1/2 teaspoon oregano, basil, salt and pepper to taste, cook on medium for approximately 10 minutes. Use as topping for pizza (on the sauce and then bake). Republished from January 6, 2016. We are so frickin’ excited! Pizza night just went into orbit! Thanks Chris, hope you enjoy it. Hi Lewis, thanks so much. No more take out pizza for my family!! This is the BEST and easiest pizza I have ever had. IT IS AMAZING!!!!! After years of trial and error (and epic fails) I have finally found a recipe that is simple to follow, and fool proof. Delicious and kid friendly to boot! Thank you for saving our pizza night!! This is the best dough recipe. It’s the same as a pizza shop. Hi Damian, thanks so much so glad you like it. And thanks for the great compliment. Have a great Sunday. I see this serves 10. How many pizzas is that and how big are they? Hi Mely I usually make 2 large pizzas (about 14-16 inches) and 1 small. Which makes it about 2 slice a person. Hope that helps. Our family pizza night is incomplete without this terrific pizza dough! Oh I can think of so many ways to use this pizza dough recipe. So excited. YAY!!! This recipe is amazing! I made homemade pizza for the first time last night and it was a hit! Hi Savannah, thanks so much, so glad it was a hit and you enjoyed it! Have a great weekend. That’s an awesome recipe but unlike other recipes especially “original Neapolitan” pizza dough ones, this one uses a lot of yeast. So i asked myself whether it should be 1 1/2 teaspoon instead of tablespoon? For example most of Neapolitan recipes use 3 grams fresh yeast (which equals about 1 gram active dry yeast) per 1000 grams or 1 kilograms flour. I guess it would be more understandable if the measurement of the yeast would be given in grams or ounces as for example here in germany a package active dry yeast contains 7 grams. As I said if I go by 1 1/2 Tablespoon, this equals about 1 1/2 package of active dry yeast which seems way too much on the amount of flour used in the recipe here. Although still an awesome recipe and great for cast iron pan pizzas. Hi Safra, here is the link with the recipe for the homemade tomato pizza https://anitalianinmykitchen.com/pizza/ hope you enjoy it. Hi Leela, thanks so much, so glad you both enjoyed. Nothing like homemade pizza and great idea with the bread. Have a wonderful weekend. You don’t mention what size pan these 1/3 pieces should be fitted into. I’m about to find out, but it would be better to know in advance. Hi Brian, it really depends on how you like your crust, whether thin or thick crust. Probably 2 small and one medium. Hope that helps. Can I know if I can substitute the all purpose flour with bread flour? Hi Freda, yes it’s a 1 for 1f and all the same ingredients. And yes you are right it does stretch better with bread flour. Hope this helps. Let me know how it goes. I’d also add a tablespoon (or a little less) of diastatic malt powder. It gives the pizza bread a nice brown crust and helps the dough rise. It also adds some sweetness since it breaks down the starch in the flour into sugar, so you may want to add less sugar with it. Great idea Adrian, thank you. Hi I’m making this for the first time, my question is, if my toppings are just sauce and cheese, would I bake it with just the sauce first and then add the cheese for the last 3 or 4 minutes? Our entire family loves pizza and would eat it every day if I made it. Needless to say, I don’t do that but I do try to make one at least every other week. I have been buying my pizza dough from our local store but have wanted to try to make my own dough for quite some time. I think your recipe just might be the answer! It looks similar to my other bread recipes so I know making the dough won’t be difficult so now all I need is the time to give it a try. Can’t wait! Thanks for the great recipe. Hi Linda, we like to eat pizza once a week and this pizza dough is really easy and I hope you enjoy it. Let me know how it goes. Have a wonderful Sunday. Hi Jenn, great, thanks so much. So glad everyone loved it. Have a wonderful Sunday! Question,can this recipe be frozen.There are only two of us so too much to use at once. Hi Jackie yes you can freeze it. Just let it rise fully before you freeze it you could also divide it into portioned pieces for single pizzas if you want. The dough can be frozen for up to three months and it just needs to be thawed in the fridge overnight before you use it! Hope that helps. Hi Jackie, your very welcome. Do you let it rise the second time before you freeze it? Hi Elaine, actually it only needs to rise once and rest for 20 minutes so that it is easier to shape. You could actually freeze it after it rises, since you are going to freeze it there really is no need for the 20 minute rest period. Hope that helps. Rose, THANK YOU for this perfect pizza dough recipe. I baked each for 15 min @ 450 F then added cheeses for another 3-4 min on my pizza stone. It was so good! Order-in won’t be happening again at our house. I also made your tomato sauce, simple & delicious. Hi Marlene, thanks so much, so glad you enjoyed it. Have a great week. I loved the texture of your dough and it came together so nicely. I am wondering if anyone else mentioned that 1 1/2 Tbsp of salt caused the dough to be a little salty tasting? Did you mean 1 and 1/2 tsp? Hi Cheryl, I make this quite often but you may be right, thanks for noticing that. Sorry about the salty dough. Hi Roger, yes removing it a couple of hours before should be fine, I hope you enjoy it. And thank you, you too. Have a wonderufl weekend. I’ve been looking for a good pizza dough recipe and this is it!! Thank you!! I live in Rural Alaska -Port Lions which is on Kodiak Island. No store here and didn’t have olive oil. I substituted vegetable oil and it turned out wonderfully. I plan to christen my “egg” and its lava stone tonight. Cornmeal on the paddle for ease of transferring pizza from paddle to stone . . . no problem. In the future, I plan to use your pizza dough again, and use a pizza pan, but will I need to lightly oil the pan or use a little cornmeal to prevent sticking? Thank you for what promises to be a fantastic pie dough, and for your reply. Hi Terry, thanks glad you like the pizza dough, I always use a little olive oil to prevent sticking rather than cornmeal. Have a wonderful Sunday. I love Italian food and want to organise a dinner party. I would love to make your pizza but have tried homemade pizza base before and it has been a disaster! So keeping my fingers crossed that this recipe will be my first successful homemade pizza base. But I just wanted to ask; I can only get my hands on instant yeast here. Should I follow the same protocol as your recipe? 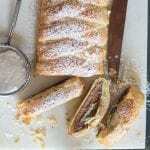 I tried this recipe and loved it. I reduced the salt to 1 tablespoon. Is it correct that it is suppose to be 1 1/2 Tablespoon is that the correct amount? Thanks Gail, so glad you and your husband enjoyed it. Huggzz to you too. Have a wonderful Sunday. Can you tell me? At what stage did you freeze? Before or after rising? Thank you. Hi Iris, you can freeze the dough after the rising, for up to 3 months (freeze it in a plastic bag). And when you are ready to use it, put the frozen dough in its bag in the fridge and let it thaw overnight or for at least 12 hours, then remove it from the fridge and let it sit out for about 30 minutes, then proceed with the rest of the directions. Hope that helps. Hi Ninette, yes you can freeze it for up to 3 months (freeze it in a plastic bag). When you are ready to use it, put the frozen dough in its bag in the fridge and let it thaw overnight or for at least 12 hours. 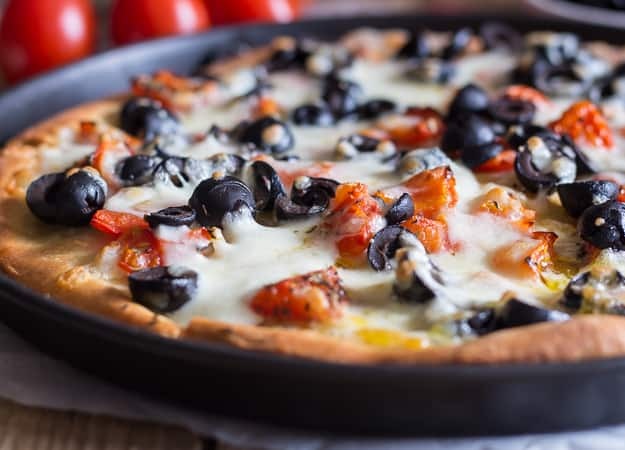 Before you make the pizza, place the dough on the countertop and let warm up for about 30 minutes before stretching it out to make your pizza. Hope that helps. Heirloom recipes are the best! They always work no matter what. 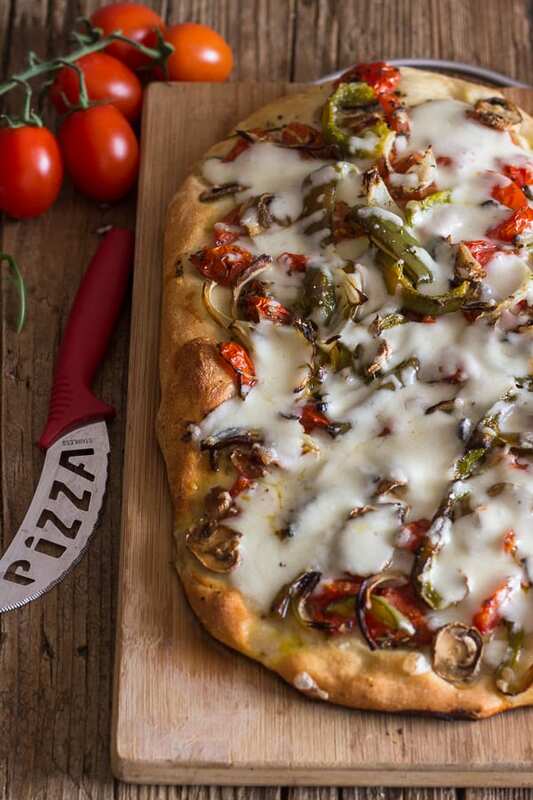 I’m going to try this dough over the weekend, because we are all pizza lovers in the family. Hi Richa, I agree they are the best, hope you enjoy it. Have a great weekend. Hi Brian, great, I want one of those things too! Let me know how it turns out. Have a great week. Hi Tina, thanks I hope you enjoy it. Let me know. Pizza is favorite in home, I will try your recipe next time. Hi Swathi, a favourite in our home too, let me know how you liked it. Rose, can you tell me what kind of flour you use? That sure can make all the difference in any recipe. Just stumbled onto you thru Pinterest a few weeks ago. Thanks for all the Italian recipes and the time you take to post. My New Years resolution is to eat Italian whenever possible this year. Might as well eat the best food on earth! Hi Paula, Thank you for your kind words. Great question you have on flour, I have done some searching and I discovered that in Italy flour is measured by how finely it is milled, whereas in most of the other countries (United States and Canada included) it is measured by its gluten content. That being said for pizza I use flour 0 which would be equivalent to bread flour. I have also heard that some stores do sell flour 0 and 00 now (00 I use for baked goods).I must say there is so much variety with Italian food, everyone is happy. Enjoy and Happy New Year! I forgot to say that flour 00 is equivalent to all purpose. Thanks for the dough recipe. I am often afraid of making my dough from scratch. This one looks like something I can handle. Thanks. By the way, your recipes sound wonderful. I love Italian food. 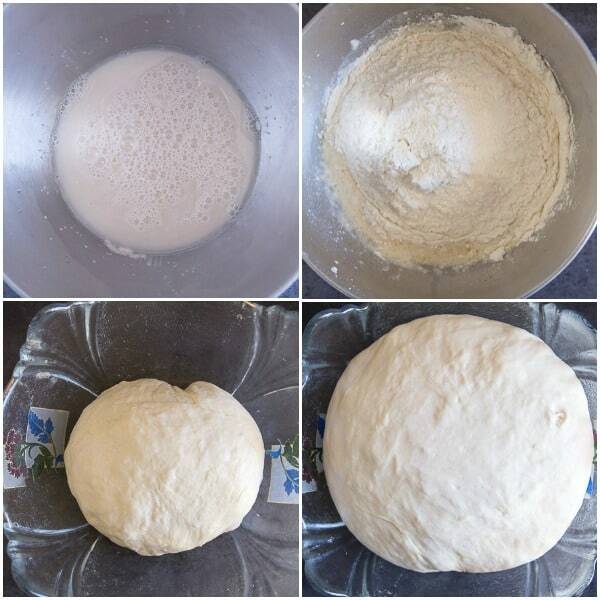 Hi Analida, thank you very much, this is a really easy pizza dough, hope you enjoy it! Stopping by from the Flashback Fridays link up. Friday is always pizza day in our house. We have only bought the premade dough but might have to try this out instead! Thank you for sharing. Hi, thanks for stopping by if you try it let me know how you liked it. Have a great weekend! 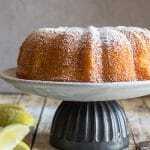 Hi Vashti, thank you, I hope you enjoy it, so easy and really delicious. Have a great weekend! Tried this dough recipe today and it was excellent. Usually I buy my dough from a local Italian grocery on the other side of the city. No more…now I can make a far better pizza …all on my own! Hi Cathy, thank you, glad you liked it! Have a great weekend. I can’t wait to try this recipe. I can always use a new recipe for pizza dough. Thanks for the post. Hi Annamaria, let me know how you liked it. Thanks for stopping by.